Israeli fire chief speaks about combating terror arson in the south and Judea and Samaria, preparations for major earthquake. Dudi Simchi, the chief of the Fire and Rescue Service, spoke to Arutz Sheva about how the firefighting forces cope with the phenomenon of kite terrorism and arson, which causes dozens of fires on a daily basis throughout the Gaza envelope and the Negev. "There are many fires in the area, but the firefighting and rescue forces are coping with this very well, in cooperation with the Chief of Staff, the Jewish National Fund and IDF forces." Simchi said. Simchi noted that the firefighting forces have improved their ability to minimize the damage caused by the fires. "Unfortunately, many dunams were burned, but we can say that in the past week and a half, the amount of area burned has been small, mainly due to the faster activity of the firefighting forces." 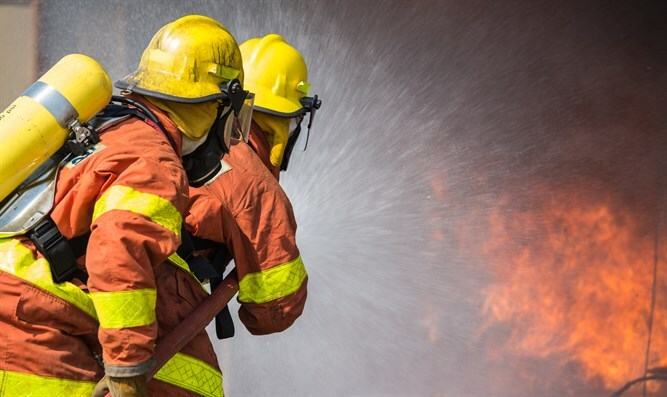 "The residents of the south, residents of the Gaza perimeter, are amazing people who do excellent work and cooperation is what enables us to cope with fires in a much more efficient and effective manner," added the firefighter. Simchi also referred to the question of whether preparations are being made for a situation in which kite terrorism will spread to Judea and Samaria and responds, "We have been preparing for a few months now for instances of [terrorists] setting fire to Judea and Samaria. and we work together with the heads of the local authorities and the army. We will explain to the population and make sure that there is no weeds that will allow the fire to spread, along with the observations and forces of many volunteers in Judea and Samaria, we will also minimize damage caused by the arson." The Fire Commissioner also spoke about the country's preparations for a severe earthquake, in light of the recent series of minor earthquakes in northern Israel. "I think it is impossible to know when a strong earthquake will occur, so all the citizens of Israel must prepare for an earthquake, and we must see that we are preparing and knowing what to do. And I very much hope that we will not have to use these capabilities."